Base of Operations: England, "Earth-98125"
Powers/Abilities: Captain Britain wielded the Sword of Death and Amulet of Life, mystical artifacts. Combined, they granted him courage and determination. The full nature of his powers is not known. (Marvel Vision#25 - Timeslip) - While fleeing from Joshua Stragg, Brian Braddock came upon the Siege Perilous, and was confronted by Merlyn and Roma of Otherworld. They informed him that he had been chosen to save his world, and presented the Amulet of Life and Sword of Death to him, asking him to choose one of the items with which to combat evil. Brian chose both items, and was transformed into Captain Britain. Having the "mixed bloods of lions and dragons," Brian was granted great courage, enabling him to overcome his fears of failure and bouts of anger, allowing him to be a bold, chivalrous knight. Captain Britain went on to faces menaces such as Morgane Le Fay, the Sentinels, Arcade and Mad Jim Jaspers. All of England hailed Captain Britain as their new hero, regarding him as either King Arthur returned from the dead, or the living spirit of England's courage and bravery. Comments: Created by Matt Smith. 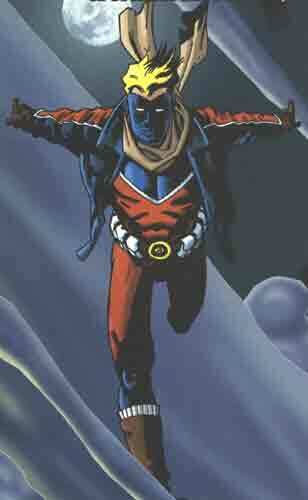 This is one Timeslip character who could conceivably turn up in regular continuity, via the Captain Britain Corps. This reality diverges from the events of Captain Britain I#1. This Captain Britain's Mad Jim Jaspers is presumably a different entity from the Earth-238 or Earth-616 Jaspers.